Two Little Snowflakes is a 20 minute family musical about friendship and the spirit of Christmas. It was inspired by events of 9/11 and serves as a reminder to us all the importance of cherishing our friendships. The musical follows the life of two little snowflakes on their journey from their clouds in the sky as they fall to Earth, melt into water droplets, and fuse with a seed, eventually becoming a beautiful oak. 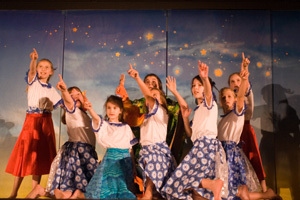 The circle of life and the true meaning of friendship are in the forefront of this musical play. This delightful story has been used both as a Christmas story at community events, in schools as a year round play, and at TUNES IN TIMES SQUARE in the past. In the last few years we have performed it primarily in November and early December.